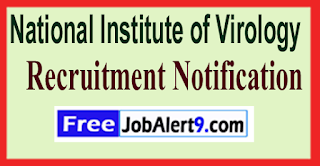 NIV (National Institute of Virology) Has Released Recruitment Notification For 14 Scientist, Project Technician, Data Entry Operator Posts. All Eligible & Interested Candidates Can Apply Offline. 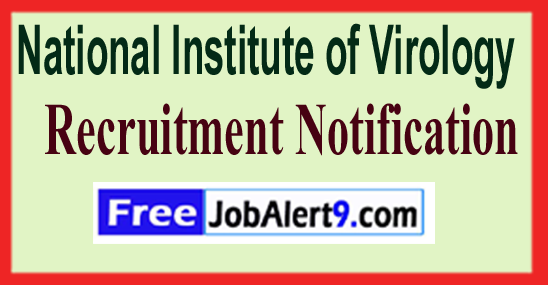 Further Detailed Information Regarding Educational Qualifications, Age Limit, Selection Procedure, Exam Pattern, Syllabus for NIV (National Institute of Virology) Recruitment 2017 - 14 Scientist, Project Technician, Data Entry Operator Post is mentioned below. Age Limit - Candidates upper age limit should not Exceed 40 -Years (Post 1), 35 -Years (Post 2,3), 30 -Years (Post 4), 28 -Years (Post 5), 25 -Years (Post 6). Educational Qualification - Candidates should have done 10th / 12th / Diploma / Graduation Degree or Post Graduation Degree / its equivalent qualification from A recognized university. Pay Scale - Rs. 64,000/- (Post 1), Rs. 61,000/- (Post 2), Rs. 48,000/- (Post 3), Rs. 18,000/- (Post 4), Rs. 17,000/- (Post 5-6) . How To Apply - All Eligible & Interested candidates Can Download application Form through official web-site (http://niv.co.in). After Filling The application form, candidate must send by hard copies of application a long with relevant testimonials (Mentioned In Detailed Advertisement) to the following Address before / (31st May 2017). Address -Principal Investigator, Acute Encephalitis Syndrome Cell, Baba Raghav Das Medical College, Gorakhpur (UP) 273013 . End Date of Application Form Is -31-05-2017. Click Here For NIV Recruitment 2017 Detailed Advertisement.